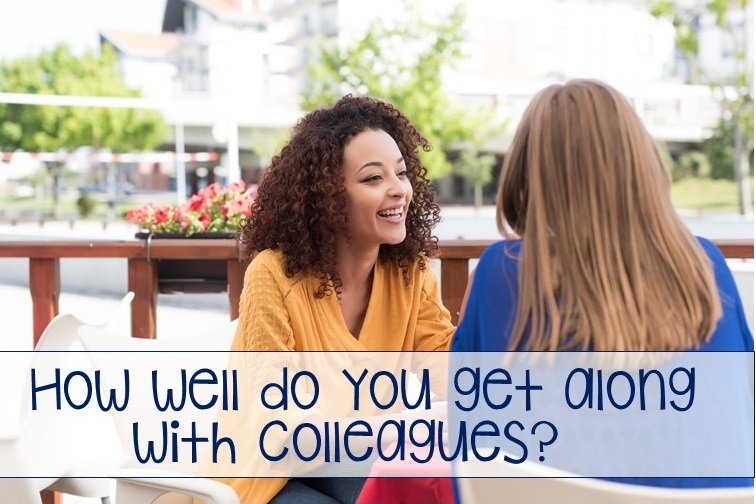 A First for Everything : Do You Get Along With Colleagues? This isn't going to be a blog post that offers you great advice to use for your next math lesson. This post will not give you a great new bulletin board idea. No strategies for math workshop here. But maybe...just maybe...you can relate. Maybe this post will remind you of yourself, your school, or your colleagues. Do you find it hard to get along with others sometimes? I do. There. I said it. I don't mean- "hard to get along" as in fighting or arguing. I mean "get along" as in, fit-in or belong. As I scroll through Facebook and Instagram and see teachers all buying the same pairs of shoes, earrings, purses, and planners I wonder if perhaps others feel the same way I do. I don't think I've always felt this way. I don't remember feeling this way in junior high or high school. In fact, I found it easy to get along with others then. I'm sociable and I had a lot of friends. Good friends. I'm still friends with many of them. As I've gotten older, it's harder. Maybe it's because I spend a lot of time with my husband. The truth is- I like him. A lot. He really is my best friend. Or maybe it's because I am too busy as a full time working mom of 3. Or maybe it's because I don't really enjoy shopping the way most women do. But the truth is, I think I feel this way because ... if I'm really honest...I feel a bit intimidated. Wow. That's hard to say and hard to admit. I've always wanted a public school job. I began my teaching career teaching in a private school and then one year turned into another and another and then next thing you know...16 years passed. And then...I was 40- trying to get my dream job of teaching in a public school and it was hard. A lot harder than I thought. I felt like everyone knew more than me and it was incredibly humbling. I second-guess myself. I make mistakes. I forget things I should have remembered. I feel overwhelmed. I look around at my other colleagues who seem to have it all together and man....how do they do it?! And suddenly...I feel inept. Is this feeling legitimate or paranoia on my part? These are still feelings I'm trying to work out. Are they valid? After a fallout with a co-worker over something that had completely taken me off guard, and was not something I had done but she had thought I had, it shook me. I stopped socializing after school with co-workers. I stopped going to holiday parties and get-togethers, worried that I wouldn't fit in, didn't belong, or wasn't wanted. At the root of it all I just felt like - who would even notice if I was there. The truth is - my classroom is well-kept and well-organized. The projects that hang outside my classroom door are cute. On the outside, I guess, no one would ever know I have these feelings. But I do. And I wonder if other teachers do too. The truth is, I started creating products for Teachers Pay Teachers because I wanted and needed the validation that what I have to offer is something of value, because I don't feel that in my job. I'm still trying to figure out why that is. Is it my personality? Am I the type that needs a "verbal hug" a lot? Is that my "love language", or whatever you call it? Or has the profession beaten me down a bit and I need the affirmation that it's still a profession of integrity? Or is there merit to how I feel? I'm not a first year or even a ten year teacher. I'm not a veteran either but I don't feel like I fit in-in the teacher's room, lunch room, or social events. Do other teachers feel the same? And if so, how can we change that? Education has changed so much. And let's face it folks, this is a tough job. It's not for the faint of heart. How can we support one another when it gets tough? How can we lift one another up when we just don't feel good enough? Last week, I joined Sheila Jane's Teacher Happy Membership. I have found a community there, and here in the blogging world, of really great, supportive, and happy teachers. My goal is to take the feeling with me into the lunchroom and the teacher's room for those times when I'm feeling insecure and unsure. I love this post because I have lived it. We are soul sisters, my friend. Be strong. Be yourself. Be what your students need. Be happy. BE YOURSELF!!!! It's so fun to meet and be around all types of people -- it's what I love about teaching and this virtual world of ours. I am so happy you're finding your place -- :) You are NOT alone!